How Do You Prioritize Projects On Your Team? Do you ever get overwhelmed by all the possible directions you could go in with your team? In my last job we faced a crisis. Our program had been funded by one large federal grant, and we had just been informed that we were being cut by 54%. We then learned that the grant would be eliminated entirely in 16 months. We had 16 months of less than half funded runway before we were going to cease to exist. Unless we did something. Something, anything, everything… When I could get in a good head space the possibilities seemed endless and overwhelming. When the tragedy of the moment overtook me it felt helpless and overwhelming. How to tame the overwhelm of where to go next? To move us forward I led my staff in a Resource-Impact matrix exercise. First, the staff brainstormed all the possible ideas we had for how to pivot and generate new funding, and then each person wrote their ideas on sticky notes. Next, we used the collective wisdom of our group to weigh all of the options and prioritize each idea. We did this by drawing a simple graph with an X and Y axis. On the X axis I wrote “Resources” and on the Y axis I wrote “Impact”. Then we took turns placing the sticky notes where we thought they belonged on the graph based on the amount of resources they required and the amount of impact they could have. Once we had all the ideas up on the graph, we divided the results into four quadrants to help us. This helps decide what to do next. For example, you may have a big idea for something that would take a lot of work (resources), but if it works it could have a huge impact. This is a “go big or go home project”. A project like this can be great, but it has to be acknowledged for what it is. It is a moonshot. Should you choose to take it on you have to be ready to invest. Also, you can only afford to do one of these types of projects. 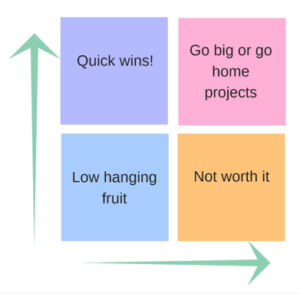 On the flip side, “Low Hanging Fruit” projects can seem like a great idea when you are overwhelmed. They are easy! However, a “Low Hanging Fruit” project does not have enough impact to make a real difference and is usually not worth it. See if there are any “Quick Win” projects instead that you can start with to build momentum. And finally, if you have any projects that are draining your resources and do not have the potential for a big impact, these are “Not Worth It”. They have to be cut so that you can better prioritize your resources for what truly matters. The matrix exercise can be a useful framework to talk about the hard questions of what you should keep doing, stop doing, and start doing. 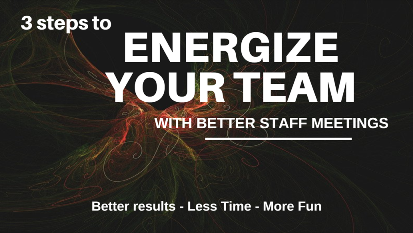 For more ideas on how to energize your team with more productive staff meetings, check out my free toolkit.